Hi there, readers of ideaswilltravel.com. Most likely you are not reading IWT to make this world a better place. But we’ve all been a part of something big this year ;-) This summer IWT wrote about the Great Pacific Garbage Patch, how it was dicovered in 1997, and how knowledge of its existence has only lately travelled into the public realm -- via YouTube. Many more people on the web did similar things. And here we are! As of November 17th 2009, The Garbage Patch has become a cover story in USA Today. It doesn’t get more mainstream than this. (Nov 17th US issue, Life Section). However, since the actual story of the Garbage Patch is a rather a long-winded one, it won’t give good headline for mainstream media. What do you need instead? A celebrity. Or semi-celebritiy. Or someone with a semi-celebrity name. 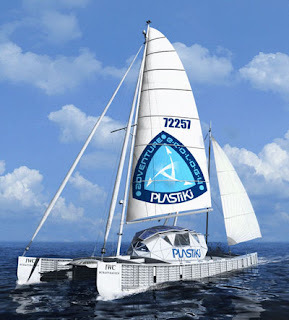 Inspired by Kon-Tikis minimal approach to seatravel, De Rothschild has built his Katamaran Plastiki entirely out of recycled material -- mostly used plastic bottles. His plan: to sail through the Garbage Patch, collect samples and then sail on to Sydney. The whole project tries to generate a maximum of buzz, while using a minimum of new resources. There are even workout-bikes on the Katamaran’s pontons that will be used to generate electricity. What interests IWT first and foremost, however, is the combination of value-adding links that contributed to the news-worthyness of De Rothschild’ ideas. As there are: The Patch, linked to an eco-activist, linked to the Rothschild fame, linked to the original Kon-Tiki adventure, linked even to Thor Heyerdahls granddaughter. Josian Heyerdahl is a “consultant” on the project and will temporarily join them on the boat. In olden times, this would have felt like a totally over-determined story. Single-mindedness was the way to go to get though in the mass media. Not anymore. Success in the social media often demands a variety of hooks for a barely aggregated readership. That the Garbage Patch has found its place in such a multi-linked story is a good thing. Rethinking waste as material is an idea that travels better this way. But this strategy also comes with a dangerous tempation: to put more energy into crafting the story, and less into assessing the feasibility of the actual project. The Plastiki was supposed to set sail months ago, and at this moment, it still only cuts through digital waters is a lavish 3-D animation on the website. Glimpsing at the National Geopgraphic blog that is covering the preparations, it seems that using used and fragile water bottles to withstand the grind of a 10.000 mile-long ocean traversion might be a noble idea, but not a safe one. The actual journey will be covered on its own website, and on facebook and twitter, but also at Nickelodeon. National Geographic Adentureare is even supposed to have a fulltime blogger standing by. It’s WordPress. The Design is called Magazine Basic. Just came across your blog today and I really like the design. Is this movable type or wordpress?